(Free Press Release) REconstruct KC, the leading renovators in Kansas City offers a comprehensive home improvement services at an affordable cost. Overland Park, Kansas (newpressrelease) December 7, 2017 - With over 30 years of experience in the industry, REconstruct KC has been providing exceptional home improvement services in Kansas City at an affordable cost. They provide creative design, quality craftsmanship, and a breadth of knowledge to complete your residential or commercial project on time and within an affordable budget. "It is our mission to provide homeowners with the resources and knowledge to fulfill their wants and needs at the right price. Our friendly, knowledgeable and professional staff will help inspire, educate and problem solve to achieve the best possible results for you, our client. It is our vision to create an environment of trust with you through clear guidelines, communication and skilled workmanship improving your home, one room at a time," said Lynneah, the president of REconstruct KC. At REconstruct KC, they focus on modern, new home construction and the modern retrofit of existing homes. They combine innovative construction with dynamic architectural design to satisfy a growing market of interest in design. Whether it is a new build, room addition, or kitchen renovation, REconstruct KC completes the project with great customer satisfaction at a transparent budget. They excel in in delivering a great product is grounded in the principles of quality and sustainability. "Our experts at Reconstruct want to make you and your loved ones feel safer at home. Let us create a custom environment for your family that is accessible." "Our experts of kitchen remodeling in Kansas City specialize in cabinets, countertops, sinks, faucets, fixtures, pull out drawers, shelves, lighting, islands, appliances, ranges, refrigerators, microwaves, cooktops, wall ovens, range hoods, built-ins, pantries & more," explained the president of REconstruct KC. One of their happy customers stated, "The professionals at REconstruct KC were honest and upfront during the entire project and we knew they had out best interests at heart. The quality of work is amazing and we fell in love with our home all over again." 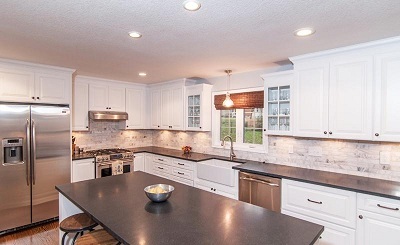 REconstruct KC, the leading kitchen and bathroom renovation specialist in Kansas City has over 30 years of experience in offering home renovation services that make you and your loved ones feel safer and comfortable at home. Visit https://reconstructkc.com/ for more information.